A couple of herring fishermen in Norway reeled in a whole lot more than they were expecting. The Daily Mail reports the pair were fishing off the coast of Troms when all of a sudden a pod of gigantic humpback whales swarmed upon them. The magnificent encounter was captured on camera - as were the fishermen's stunned reactions. The video footage starts out with seemingly cold, and calm waters as the men fish. But before long the water starts bubbling, the whales start spouting water, and the pod emerges at the surface - flapping their fins on the icy water, and exposing their big bellies. With the large ripples in the water, the fishermen expected a whale - but they had no idea an entire pod was going to surround them, "I don't want to be any closer than that" one of the men exclaims nervously in Norwegian, the pod just nearly missing their boat. The Daily Mail explains that it was November when the fishermen spotted the pod, and that the region the fishermen were is in the north of Norway, just above the Arctic circle. 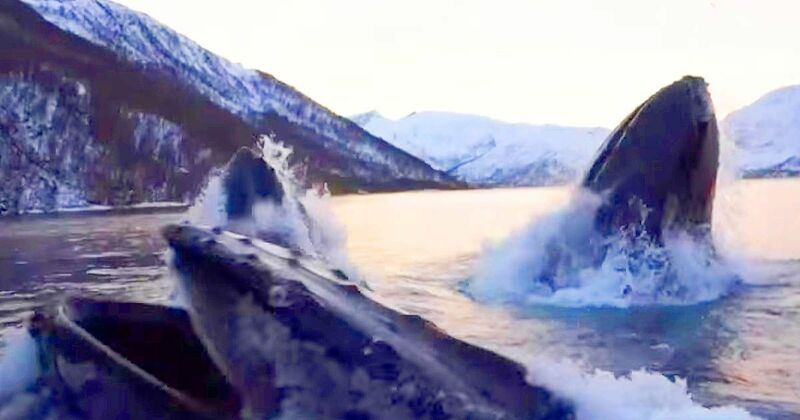 The Norwegian Polar Institute says humpbacks usually spend the cold winter months in more tropical waters - but maybe the whales were headed that way before saying goodbye to their friends on the boat. Check out the incredible footage here below, and don't forget to share it on Facebook, Twitter, and Pinterest.